Project No. 2 is located in Section 21 of Garden Township in Polk County. The outlet to this basin filled with snow each winter and during the spring run off, the basin would fill with with water. 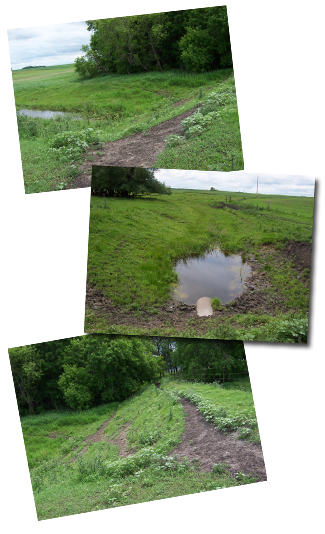 Upon snow melt, the ditch would send a torent of water downstream, causing the towship road and culvert to blow out. The flooding would then spill over Polk County #1. This created a dangerous situation for traffic and continuous damage to the township road and culvert. The detention dam began was constructed in the outlet channel and included a 24" pipe which held water back for several days with a gradual release, eliminating damages. On June 5, 1975, the Board authorized preliminary studies on this project. On October 2, 1979, the Engineer's Report was presented to the Board. The Board hoped to fund this project totally between the Lower Red River Water Management Board and the Sand Hill River Watershed District. On October 3, 1979, the Sand Hill Board was granted 90% funding from the Lower Red River Watershed Management Board for this project. The Department of Natural Resources permit was applied for on October 5, 1979. The report of the Director, Division of Waters, Minnesota Department of Natural Resources, was received December 14, 1979. This conditional permit authorized the Board to construct this dam after the Dam Safety Section approved the final plans and specifications. Dam Safety Section's approval came with the authroized permit on December 28, 1979. The Water Resources Board's comments were received January 18, 1980. The Bid opening was held July 1, 1980. The total project cost was just under $12,000. The SHRWD is currently working at developing a solution to resolve long standing drainage issues upstream of the dam. Historically the upstream watershed was primarily drained and under agricultural production. As a part of this effort, the SHRWD plans to coordinate with regulating officials to determine an acceptable modification to the structure. The SHRWD also recently completed a sediment cleanout of the downstream channel to remove any blockages.